He scored a hattrick at the weekend and now has 15 goals so far this season. What could have been, eh? [quote user="True Grit"]We''ve seen it time and time again, gain promotion to the top flight, couple of seasons and we''re back down. We were lucky yesterday, we should have walked that leauge, but it shows that the players are more concerned about going on holiday than serving the club and fans – no victory parade..?? really??? [/quote]Are you the sort of person that reads this and a) fails to see the irony, and b) thinks ''yes, that''s sensible''? [quote user="morty"]Buy one of these, all the football you''ll ever need.http://www.nanotvonline.co.uk/[/quote]How does that work? Does it even work at all? And from abroad as well? The site is a bit short on detail, but appears to claim to have everything and anything you want, on demand, for free. No subscription, you just pay for the box. That sounds too good to be true, surely? I was totally nonplussed when we signed Jerome and assumed he would just be a backup, but he''s turned into one of my favourite players this year. Whenever he''s put on media duties his interviews are great, he''s articulate and interesting, and he''s very cool and calm even when scoring (3rd goal against Ipswich was brilliant, both the perfect poke past the keeper and the celebration). Very impressed by the way he dealt with not starting for a few periods during the season as well. BJ still player of the season, but Cam comes close for me personally. We really needed a 20 goals/season striker - I just didn''t think it would be him at the beginning of the season. Very glad that it was, though. I think he''s desperate for another chance to show he can do it in the prem, and Norwich and AN could be the team and manager to help him do that. Hope that works out, but I''ll always be grateful for and respect him for what he''s done in the last year whatever happens. [quote user="Reggie Strayshun"]I liken people grumbling about NA''s taking of the job to those who witter on about illegal immigrants claiming the dole/social etc. You cannot blame him/them for doing it. It is the system that''s wrong, for allowing it to happen in the first place. [/quote]Sorry for going OT, but this lazy stereotype drives me mad. Appreciate this may not be popular, but I will say it nevertheless because it is true.Illegal immigrants can''t claim the dole/social/any benefits whatsoever. If they tried to it would clearly identify them as in the country illegally and they would be deported.Legal migrants may be able to claim support, depending on their circumstances (and note that the EU''s free movement of people principle only applies to those seeking work, and there is no provision that benefits have to be paid to people who move without a job). And of course a far smaller proportion of immigrants (both EU and non-EU) do so than the "native" British population, and the overall net contribution (taxes paid minus benefits claimed) of the immigrant population is overwhelmingly positive. This is in contrast to the British expat population in other EU countries (which is roughly the same size as the number of EU migrants in the UK), in fact - a large proportion of whom are retired people in places like Spain, where they pay little in the way of income taxes yet use services such as healthcare disproportionately (plus other services in their local areas that everyone takes for granted such as roads, local authority responsibilities and so on, which aren''t necessarily paid for by their contribution to local taxes, because in many countries local tax contributions are tied to taxable income)./rant over. [quote] Without doubt, Gunn''s tenure ended in calamitous fashion but to write off Adams reign as a similar failure does him a disservice. If we ignore the 5 Premier games he had - which were every bit as bad as anything which had gone before - he hasn''t done THAT badly. He left us in 7th place, in touching distance of the play off places and at the halfway point of the season we had achieved just about half the points (75) usually required to make the top 6. We won against - and completely outplayed - the Scum, had topped the table and had fans proclaiming that they had "their" Norwich back. Ultimately, he was unable to oversee a level of performance that was consistent enough. We could be excellent one week (Derby) and hapless the next (Reading). We certainly played like the best team in the division on occasions but we failed to make our dominance count. Adams has, honourably, taken the can for that but I''m sure that the players appreciate that they have been done a bit of a favour there. Whether Alex Neil can find the key to that consistency remains to be seen; if he does we could well go up. Should we go up, plaudits will rightly be showered upon Alex Neil and the team that saw out the season but it will also have been built on a platform of Adams. Some folk want to criticise Adams signings, in the next breath they''re suggesting that we should be top of the table because we have the best squad in the division. You can''t have it all ways. As I said, Adams left us in 7th spot. Since we were relegated in 1995, in the seasons we''ve spent in the Championship (all but 5) we''ve only bettered that as a finishing position 3 times. He wouldn''t have been my choice, he wouldn''t have been most peoples choice I''m sure. But he certainly didn''t fail in epic Gunn proportions and he did a damned sight better than many peoples choice Malky has done so far at Wigan. I don''t think this spell has tarnished his reputation either; he left a foundation to be built and improved upon and with his head held high. Perhaps he was found wanting but his stock hasn''t fallen for trying. [/quote]^ thisOne of all too few measured, thought through and intelligent posts on this forum. People need to get a sense of perspective. It didn''t work out with NA because we weren''t meeting our target of a top two finish, but it''s not as if we''re in danger of being relegated. I hope and believe that we will get better under AN, but its absurd to make out that the first half of this season has been a total disaster.On a side note, I''m still somewhat in shock that we''ve appointed AN at all. I was 100% sure when NA resigned that we were going to have Mike Phelan in charge and it didn''t fill me with any enthusiasm at all (but I''m delighted he''s staying as a coach). according to the interview AN gave that''s on the NCFC youtube channel, he''s looking to bring his current Asst. Manager down with him, but Phelan and Holt are very much part of the plans and should be staying. Btw, TGMD, I meant to say that I wasn''t being critical of your post, which I thought was interesting, but I''ve seen a few posts recently where people have said Snoddy''s contribution is overrated and I wanted to put forward something to counter that.re him playing in the middle or on the left - the ideal of course would be for any of the three attacking players behind the striker in a 4231 to be interchangeable. I''m not quite sure we have that luxury, but I also don''t think we should be too concerned about having a "traditional" winger all the time. Sadly - I live abroad - I haven''t seen enough games recently in their entirety or live, so that you can really see what players are doing off the ball etc, to get a good opinion on whether Snodgrass could play in the middle.But if Benno develops this season, CH will have the luxury of being able to choose between different tactical options depending on the opposition, our own form, who is playing up front/elsewhere across the attacking line and, of course, injuries, plus an opportunity to make a substitution to exploit particular weaknesses or change the game. That would be fantastic, and I hope would drive both players even harder to deliver as much as they can. But I still think Snodgrass would be a more likely starter for now unless and until his own form drops or we see that he doesn''t, for some reason, play well in combination with the new attacking players we''ve got this season. only one player - Leighton Baines - created more clear cut chances than Snodgrass. His 6 goals and 6 assists meant that he was directly involved in almost 1 in 3 of our (admittedly pitiful) total of 41 goals last season.http://www.whoscored.com/Blog/auzzo7zvxu-3lxa6zbzdkw/Show/Team-Focus-Keeping-Robert-Snodgrass-Will-Be-Norwichs-Best-Summer-SigningIf he "monopolised" the free kicks, then he probably deserved to. He''s not a traditional winger, pinging in crosses from the touchline, but I think he deserves his place in the team. from the reports in the Swedish press, this looks to be a certain deal and he''s on his way at the moment to sign tomorrow. Presume there will be an official announcement then. Interestingly, though, he''s said that he''s leaving Galatasary because he''s fallen to 3rd choice striker behind Drogba and Burak Yilmas. 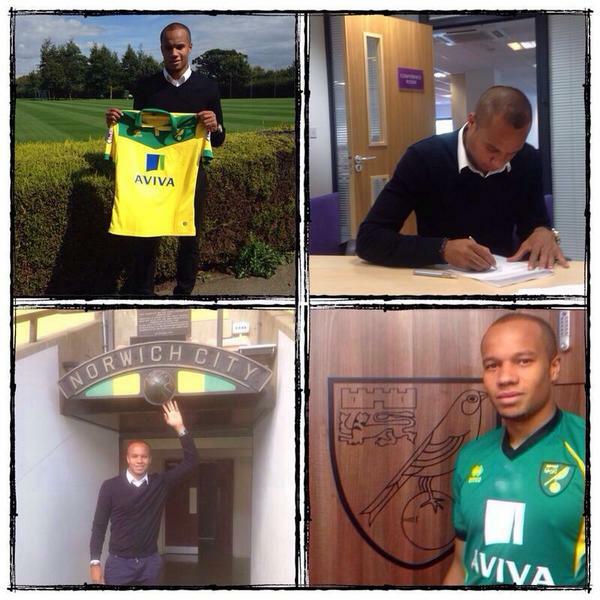 That suggests he''s expecting to play more often at Norwich - so presumably as the 2nd, deep-lying striker with us. I''d assume, therefore, that we can be fairly sure there won''t be any more strikers or attacking midfielders added to the squad after this.